Tissue engineering consists in association of cells and biocompatible materials to create artificial tissues. This approach presents an alternative to the whole organ transplantation and has a potential to solve the problem of the shortage of organs available for donation. To create new tissues in a laboratory, the development of new materials mimicking the natural environment of the cells is required. In this context, collaboration between the scientists from different disciplines (biology, chemistry, materials science) becomes necessary. 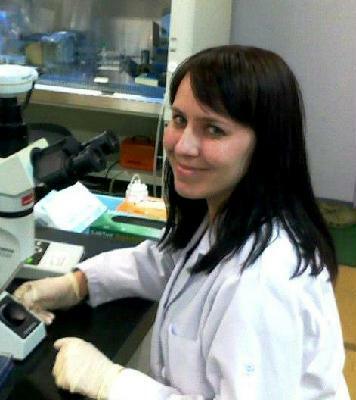 My project is focused on the development of the substrates that mimic skeletal muscle environment. We use polyelectrolyte multilayer films as a biomimetic substrate. These thin films (~100 nm) are made of polypeptides using layer-by-layer assembly method. They can be further functionalized by covalent grafting of bioactive peptides and their stiffness can be modulated by chemical cross-linking. Figure. Construction of biomimetic films with tunable mechanical and biochemical properties for the control of cellular processes. Such substrates have a potential to control muscle stem cell behavior and produce functional muscle tissue. Muscle tissues created in the laboratory can be used for muscle repair after an injury and for the treatment of muscle diseases, but are also required for pharmaceutical assays and for fundamental studies of muscle development. This presentation will emphasize the role of materials for solving current problems in biological science and the importance of interdisciplinary collaboration. Varvara Gribova (born in 1985 in Vilnius, Lithuania) received a Master's degree in Cellular and Molecular Biology from the University of Pierre and Marie Curie in Paris. Since 2010 she is a PhD student in LMGP (Grenoble Institute of Technology & CNRS) and CERMAV (CNRS) laboratories working under direction of Pr Catherine Picart and Pr Rachel Auzély-Velty. Her PhD project consists in designing biomimetic polyelectrolyte multilayer films for the control of muscle cell adhesion and differentiation.